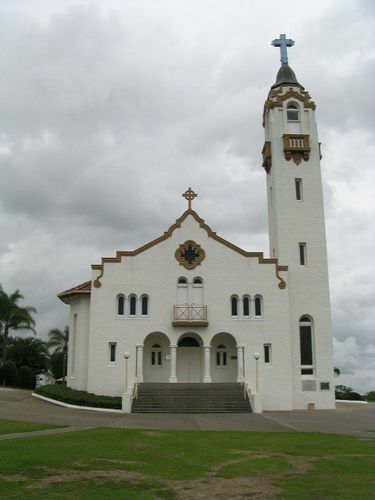 Our Lady of Victories Church was constructed by the Roman Catholic Archdiocese of Brisbane as a memorial to Roman Catholic soldiers and sailors who lost their lives during World War One. The dedication of the opening ceremony was performed by Archbishop Duhig on the 26th April 1925. The foundation stone for the Church was laid on the 24th August 1919 by the Apostolic Delegate, the Reverend Cattaneo in front of a huge gathering. Archbishop Duhig gifted the deeds of the site, worth £1500, at the ceremony free from all encumberance. A vote of thanks to the Apostolic Delegate was moved by The Honourable A.J. Thynne who pointed out that 12,000 Australian Catholic Soldiers had died in the war. The Catholic Press (NSW ), 4th September 1919.